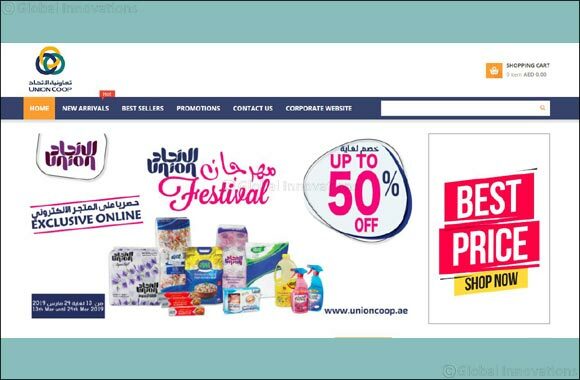 Dubai, UAE, March 24, 2019: Amidst a series of unique promotions and offers, Union Coop, the largest Consumer Cooperative in the UAE revealed that it expects AED 30 Million Sales in 2019, with more than 60,000 SKUs from its web store and online partners. The retail pioneer also listed previous year online sales as AED 15.8 Million from the web store and online partners, while expecting to outdo themselves this year by nearly double the previous year sales figure. Al Falasi said, “Compared to the now 22,357 SKUs, targeting 60,000 SKUs will enable the consumers to have a complete and hassle-free shopping experience with our web store, wherein everything that Customer requires will be at a click of a button. “One can expect more changes and updates in the future to the web store as we have to keep up with the changing technology to make the customer experience even better. We plan to expand our exclusive online promotion campaigns to cover an expected number of 60,000 SKUs by the end of 2019. Furthermore, expand the home delivery service to reach Abu Dhabi and Ras Al Khaimah,” said Al Falasi. “We are working to develop a dynamic marketplace to let suppliers participate in the e-commerce business and enable them to list only genuine and authentic items. We encourage more online marketplaces to associate themselves with Union Coop so that together we are able to offer the best-in-class e-commerce and home delivery solutions to our valued customers,” said Al Falasi.